via my flickr stream I just joined the Iphone Not group on Facebook. Pretty cool new feature from Google Maps - street view. You click on street view and you can see 360 photo of the street. 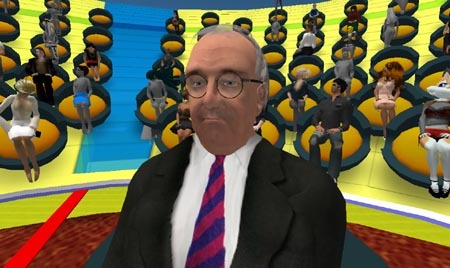 I'm reminded about what Jerry from Electronic Sheep said at the 2006 Games for Change Conference about virtual worlds as a platform. 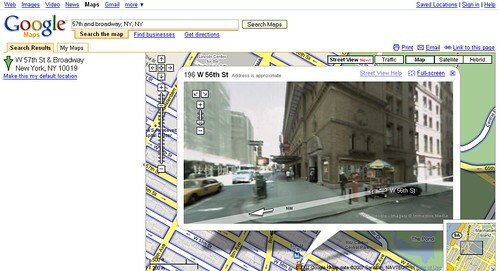 He something along the lines that the next web platform will be walking through google maps in 3D. Learned a few things from the interviewer and camera person about b-roll and directions of where to look and how to respond .. some points that Andy Carvin made during the videoblogging and nonprofits session we did at NTC. My last trip to Cambodia, I photographed monks. My best photograph was of three monks collecting offerings in Roteang Village. It has been used for the Facing History site as part of Arn Chorn Pond's story. I'm so honored. I stumbled upon your slide show of beautiful photos of Cambodia. Facing History and Ourselves trains middle school and high school teachers. We're building a website for students all over the world that profiles five different human rights awards winners. One of them is an amazing man named Arn Chorn Pond, who survived the Cambodian genocide. Would you mind if we used your image "Monks in Roteang Village" for the website? The site is currently in BETA form. Our projected launch date is Fall 2007 (late September or early October). We will then be taking the website global--it will have a wide reach and have a profound impact on many students. We really think that your photo is absolutely stunning and it fits in perfectly within the site. If you want to check it out the link is here . 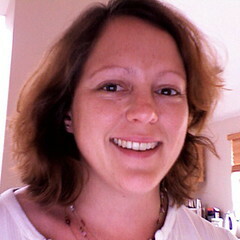 Cynthia Gibson is writing a blog called Citizen Post It's about citizen centered action and philanthropy. The most recent post asks "Can Philanthropy be Citizen-Centered?" She's the author of report called Citizens at the Center commissioned by the Case Foundation. Jason Z at DIA bog writes about the launch of "Make It Your Own: Case Foundation's Experiment in Citizen-Centric Philanthropy" which includes both MySpace and Facebook. Lucy Bernholz also blogged or rather blogged pointers to what she had to say in the mainstream media. Slide Share Show, "Putting the U in YouTube" although geared for higher education institutions provides some really good practical marketing tips for social networking sites that should be useful for nonprofits too. The Seattle's Net Tuesday Group has just launched a social networking site on ning. Net Tuesday Seattle has been in the local press too! 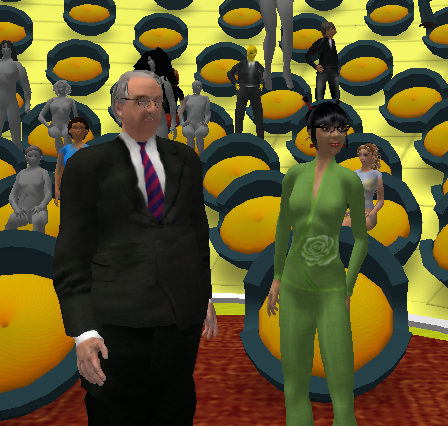 Netsquared Featured projects receive grant awards! Yikes, the first ever tag spam I've seen in the NpTech Tag Stream! It like it was also splog and closed down by wordpress. Gavin's Digital Diner has a thoughtful essay titled "Do Nonprofits Dream of Electronic Sheep?" 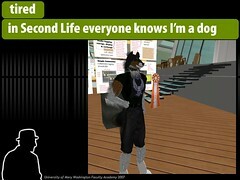 (At first, I thought the title might refer to Electric Sheep Company, a big player in virtual worlds, and that it would lead to some more reflections on the MacArthur Foundation's recent Philanthropy Event in Second Life. Then, I remembered the phrase flowed through the NPtech tag stream about six months as a reference to interface design.) The essay has nothing to do with virtual worlds or interface design. It is a lament about the phrase "nonprofits should act more like for-profits" leading some reflections about long-term thinking about outcomes. It's a must-read. 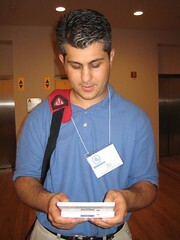 Jason Z at DIA bog writes about the launch of "Make It Your Own: Case Foundation's Experiment in Citizen-Centric Philanthropy" which includes both MySpace and Facebook. Jason notes, "Despite the institutional capacity of most funders to insulate themselves from experimental grantmaking, we're sure to see more forays like this in the years ahead, if only on an experimental basis." Jason is spot on. More about social media tools for philanthropy from Tactical Philanthropy. 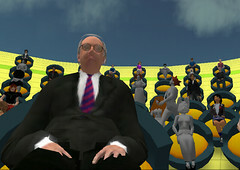 AFP Blog points the Mindblizzard Blog story about how the Dutch Red Cross will begin fundraising in Second Life using Yike Strum, a top model, as their Red Cross ambassador. Holly Ross points to Robin Good's Beginner Guide to Facebook. An excellent primer that also describes why people love and hate Facebook. For an added bonus, read Allan Benamer's terrific coverage of Facebook and Project Agape and Micah Sifry's piece on the political and social implications of Project Agape. (BTW, Allan also gives us the correct way to pronounce: uh-GAH-pay). Danah Boyd has posted a provocative essay on the class divisions she sees in users of MySpace vs Facebook. Michele Martin has some reactions. Rob Cunningham gives us a good laugh - FOAF your way to the top! "Best Engaging Communities" a large collection of best-practices info and case studies about managing online communities found by Ian Wilker. Robin Good has a nice roundup of affordable Web Conferencing Tools and a useful comparison chart in a google spreadsheet. A nice little utility that lets you embed google mymaps into your blog. RSS feeds or chunks of content. I've been looking for something like this where I could create feeds based on a category. I look forward to reading about the results of Michele's experiment. Here's another low cost email list tool, an email newsletter application just for bloggers called Zookoda. Maybe it should be added to this list of free or cheap email list management tools. Via LifeHacker, does google analytics make you say huh? These two penguins do not want closed API. Some really cool events flowing through the NpTech Tag Stream! 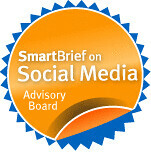 Via Cogdog's presentation "Being There"
In April, I blogged about HSUS "Stop Canada's Cruel Seal Hunt" campaign over at blogher and my blog and last December on my blog as part of a roundup of articles on using social networking spaces for campaigns. I've been following Carie Lewis's posts on the NTEN Affinity groups as well as other nonprofit tech listservs (yes, I still do read listservs) and caught up with her for an interview. As part of her job as Internet Marketing Manager in the Online Communications and Media department at the HSUS. she manages all social networking profiles, online advertising, search engine optimization, and online marketing techniques for campaigns. 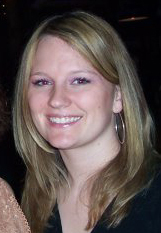 Her main focus is on ways to use web 2.0 tools for online advocacy. 1. Tell me about the Stop Canada's Cruel Seal Hunt campaign? This campaign was generated to as a unique way to get people involved in taking action against the Canadian seal hunt. We wanted something different; not just another MySpace profile. So through the eyes of a baby seal, people were able to interact with him, hear his stories, send photos of what they were doing to help, and participate in ways to take action online (posting banners, signing the boycott, sending emails to the prime minister, etc.) People became very fond of sunny and were motivated to do whatever they could to help. 2. Can you talk a little bit about how you mix or integrate social media tools with more, er, "traditional" online marketing strategies? This was mostly a myspace campaign. We pointed people to youtube to watch the videos and to our website to participate in the advocacy. We also coordinated and integrated the content and blog postings with our hsus myspace page and rebecca’s online journal, without coming right out and saying this was being put together by the HSUS. 3. Why did your organization integrate these social media tools - how did you choose specific tools? We already had a strong following on the hsus myspace and youtube channels, so we used our supporters there to direct their attention to this page. Rebecca’s online journal told the tales of what she saw, so we just reworded her experiences through the eyes of a seal and posted blog comments from him. We also used youtube because it’s a great place for us to post our most graphic videos in hopes that they go viral. 4. What kind of research or community participation or presence did you have on these social networking sites before launching the campaign? What kind of experiments did you do first? We had taken the time to build up a strong following on our hsus myspace page – it took about 7 months to get to 17,000 friends. The first thing we did was create a group dedicated to the seal hunt. We saw a flood of new members once we first created it, but then it died off. There was nothing exciting to really get people to come back after they joined. It was the same old same old – what you can do. We knew we needed a new angle, so we chose to go with storytelling. That’s why the myspace page by a seal was so effective – people kept coming back to see what he was experiencing and seeing if he was still alive – then we integrated our advos and other campaign materials into his story. We also created a custom profile and layout, which gave his page a different edge. 5. Why and how has using these tools been effective? Can you share some stats? What was the result of the myspace page? Sunny (the seal) had over 2,000 friends and 14,000 profile views in 3 weeks. We had about 500 new signups to our email list from MySpace. That includes the advocacy actions and the web banners. This does not include those who were already in our email system or have participated in advos in the past, so you can imagine the total # that participated is much higher. 6. What kinds of conversations in-house/on-staff did the desire to integrate social networking tools into your work spark? How much staff time did it take to incorporate the social media tools? 7. If you were to give advice to others about incorporating social networking/media tools, what are the five most important things to consider or do? 1 – Take the time to build your friends list. We reached out to celebrities, other seal groups and profiles, current hsus friends, profiles and groups that had to do with the issues (global warming, animal welfare), Canadian-specific profiles, etc. Post your badges on their comment space once you have friends. Promote to your current constituency in any way you can. Include a link in emails, on your campaign page, on your homepage, blogs, etc. Once we added links in these places, we received an influx of friend requests. 2 – Remember the WIIFM (what's in it for me). We created badges that people could put on their pages to show their support, instead of just asking them to take action and participate in our advos. (and these badges included text links back to our website and myspace page). Give people the text box with the code so they can copy and paste the code instead of having to download an host on something like photo bucket. Make it EASY. 3 – Come up with something different to keep people engaged. Everyone likes to have a lot of friends, but if you create a new profile for every campaign you have, you may get a lot of friend requests, but they may not ever come back. Ten different profiles for each of your issues or campaigns is boring. Come up with the big, cool idea. Then put together a strategy. 4 – Don’t engage in a social media campaign unless you have the time and resources. My position is dedicated to projects like this. I think it would be hard for someone to fit in the time it took to put this together and maintain it in addition to their daily job responsibilities. 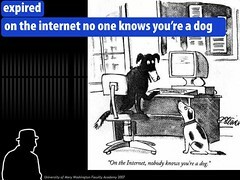 Social networking projects are not for everyone. We have a strategy and team of people in place for each campaign. Never put together a page then leave it, expecting people to come to you. Take the time to respond and interact with all your friends. If you don’t have this kind of time to do it right, find another way to get your message out. 5 – Take the time to measure results. Even though you can’t get stats from MySpace, take the time to track on your end. We source every link from myspace so we can tell what each person does once they reach our site. We can track other advos they participate in, donations they give, etc. The advo, donation, and tell a friend benefits from even one person can be incredible. Has your organization implemented a campaign on a social networking site? What is your best advice to those just starting? Leave a comment and pointer to your campaign or web site. The NonProfit Times has an e-newsletter. (Disclosure - I've written a few articles for the TechnoBuzz newsletter) But, that's not why I'm pointing you over there. This week's TechnoBuzz Newsletter has an excellent piece by Jonah Sachs from FreeRange Studios on online storytelling, making the point that you don't need the latest web2.0 technology tool, but the oldest communication method known to human beings - stories! The Heroes: Who are they? What are they trying to achieve? What person, historical figure, even animal or mythical creature might represent these heroes? Think beyond your organization's employees when searching. The hero need not be you! Oftentimes it is our constituents or those we are trying to help who emerge as the most compelling heroes in our stories. The Villains: Every story needs a bad guy. People just won't accept a struggle without a villain and with no struggle there is no story. Who stands in our hero's way? Are they identifiable individuals or a set of problems that can be personified in a character or person? Villains should feel evil in your story but that doesn't mean you have to vilify your opposition. We don't have to personally attack other people to show the problem as evil (although at times, it has undeniably worked). The Catalyst: Stories begin with a struggle between hero and villain that does not begin to resolve until a catalyst appears. Something or someone shifts the balance and the hero begins to prevail. Who, or what, is the catalyst in your story? What people or actions will come along to break the deadlock and allow the desired outcome? How can the listener (or viewer) of the story be the catalyst or cause the catalyst to come about? The other remix challenge is take the Social Media and remix for fundraising 2.0. Luckily, my colleague Francesco has remixed the game for fundraising, but it is in Italian! (cards and presentation). It's so cool that the cards have OKNO and Segnalo - the Italian versions of Digg and Del.icio.us. I wonder what they translate into? People who know me know that I am research and information junkie. This includes not only information on the Internet but also books. A big problem in my office is the lack of bookshelf space and my family does not let enter bookstores in their presence. It may be one reason why I love the documentary approach to screencasting - an excuse to add to my book collection. In the screencast wiki, I have a list of books and articles I used for the research as well as links to more comprehensive lists. I could make an entire screencast examining the excellent resources and gurus out there on the topic. Eric T Peterson is the founder of a company called, Web Analytics Demystified. He is also an author of three books on the topic: Web Analytics Demystified, Web Site Measurement Hacks and The Big Book of Key Performance Indicators. His company is built around a series of fundamental principles that he calls The Truth About Web Analytics. Web analytics is not easy for most organizations. Technology cannot replace the need for talented professionals. Web analytics is actually a series of identifiable business processes. People, technology, and process are all required to create repeatable successes. All companies can be very successful provided they're committed to understanding the process of "doing" web analytics. I just added a copy of The Big Book of Key Performance Indicators to my collection (it's an electronic book and comes with an excel spreadsheet of a worksheet). Peterson defines them as "numbers designed to succinctly convey as much information as possible. Good key performance indicators are well defined, well presented, create expectations and drive actions." When I was researching this topic, I wanted to go deeper into this area - but with limited time and wanted a primer - did not. Now .. I'm interested in the best practices around using KPI and Peterson's book is a fantastic resource. I thinking about what is translatable to nonprofits and organizations that have smaller budgets than Fortune 500 Companies. I'm really fascinated by this whole Web Analytics field (and it looks like Web Analysts are in hot demand) -- and I am especially interested in the whole conversation around analytics and social media. It speaks to my inner research geek. Well, must get back to researching for the next screencast which is on SalesForce and upcoming July training workshops which are on the topic of Fundraising 2.0. There is a terrific video series over at Social Edge called the "X Interview" where you can watch and listen to social entrepreneurs tell their stories. The videos are short, most less than 3-7 minutes, are simple -- a significant event that had a major impact on their life and how they see the world in 2017. The interview above is with social entrepreneur Roshaneh Zafar, founder and managing director of The Kashf Foundation, Pakistan's third largest microfinance institution, tells Global X why she had to unlearn what she learned about economics. She also shares what happened when she realized that she was sitting at a conference next to a gentleman called Muhammad Yunus. Dave Amos, Web guy at the Idealist (and Ami Dar) and Laura Whitehead, South Hams, CVS, who not only allowed me complete access to their Google Analytics stats, but answered my numerous stupid questions. Avinash Kaushik, Analytics Evangelist, Google, really helped me understand the true meaning of Web Analytics 2.0 and has hopefully forgiven me for not saying his last name correctly! Holly Ross for suggesting the topic and understood that it takes more than a week or two to make a screencast! For all my blog readers and participants on the NTEN Nonprofit Webmasters Affinity group who left comments, made suggestions, pointed me to resources, and shared screen captures of their stats. What I discovered is that creating a screencast is a terrific personal learning environment because you can't create a media piece unless you really know the topic. And yes, learning is time consuming and you can't really master a topic like this in 90 minutes let alone create a media piece. But a screencast forces you to organize your learnings, document them, and share them. I shared the screencast with Avinash Kaushik and frankly was a little intimidated to do so because well, he is the expert on the topic. Here was the response: "It is wonderful. The thing like I loved about this screencast is that it is real, it is true UCG and has a human touch to it." I did learn one more thing that is a best practice. One quick pointer on the date range comparison (around seven min mark). Where possible share the tip with you users that they should line up the week day of each time period if they can. Good best practice. So if your first time period starts at a Monday then just move the bars of the start date in the comparison time period to a Monday s well. This might not make for a complete month but it will ensure that for the sake of seasonality your time line compare the same week days. Else sometimes you’ll see lifts where there aren’t any. I'd also like to thank Jeremiah Owyang who graciously allowed me to use 25 seconds from his video interview with Avinash Kaushik. NP2020 is both a conference and a call to action to address a leadership deficit in the nonprofit sector. According to a recent Bridgespan Group report, over the next decade nonprofits will need to attract and develop some 640,000 leaders -approximately 2.4 times the number currently working the field. When one considers the impact of baby boomers preparing for retirement over the next two decades, there is a clear need for smooth leadership transition from one generation of leaders to the next. Who are the nonprofit leaders of the future? What skills, resources, or support will they need? How to address this growing need? What barriers exist to successful transition? What solutions lie within the nonprofit sector? As one of those "baby boomers preparing for retirement over the next decades," at first I thought this conference was only for people between the ages of 21-40. However, I misread the promotional material and Ashima Saigal, one of the conference organizers, assures me that is not the case. It will be a cross generational dialog, but they are specifically targeting younger leaders. Hmm .. I wonder if they a facebook group for the event? The conference is open space format, but the founder and executive director of Mixed Greens, Lisa Rose Starner, will give a keynote and representatives from Young Nonprofit Professionals Network will present findings from their research of member attitudes about the topic. The registration deadline is coming up next week! Here's the link for more information. As part of some research for a screencast on Google Analytics for NTEN, I gave a shout out to folks asking for examples. Laura Whitehead shared a fantastic case study! So, I was even more delighted to discover her blog and I suspect she will continue to share her learnings about using Google Analytics and other nonprofit technology topics! I was delighted to discover Stephen Downes screencast created with Camtasia for several reasons. First, I've been following the recent stream of posts about "personal learning environments" but haven't delved in depth yet. 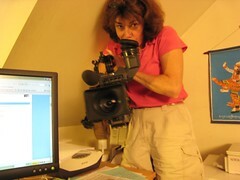 I'm interested because it is what I attempt to do with my blog, screencasting, and all the other web 2.0 tools I use. Seeing the powerpoint slides along with the commentary helped me understand the topic. Second, I'm always happy to see another screencaster, particularly one with great content, take the step of learning Camtasia. It is a rabbit hole and as Stephen notes, it does take time. I know that all too well. And now to weave these two ideas together. All my learnings about screencasting are organized in a wiki portfolio. Stephen's first effort also calls to mind another example for using screencasting - public speaking - which Jon Udell wrote about this week. I have found the wiki portfolio really useful in summarizing and clarifying my learning about screencasting from my network. Take for example this piece of learning about conversational screencasts. Finally, I wonder if the use of Soviet posters constitutes fair use? Okay, back to the final editing of a screencast I'm working on about Google Analytics for Nonprofits sponsored by NTEN. Source: Flickr In my workshop, I cover Web2.0 adoption strategies and often use this slide and talk abut low-risk experimentation. But, what the heck does that mean? Brian Kelly, whose blog feed I've added to my "Circle of the Wise" feed folder, has a section on his blog called 'Experiments. ‘Claim your Blog’ in Technorati. To explore ways in which a new blog can be found. This experiment was first announced on 6th November 2006. Follow-up reports were published on 11th and 26th November 2006 and 12 January 2007. 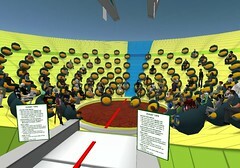 Technorati appears to be successful in helping a new blog to be found. Its use is recommended to others. 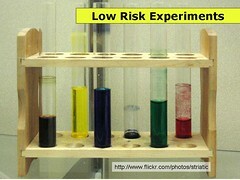 I do experiments like this, but I don't necessarily put them in a structure that allows for easy evaluation. For example, my most recent experiment was not to blog as frequently this week as I usually do. What happened? My subscriber stats went down and I got several emails from folks asking me if I was okay. I'm am inspired to do something like this and incorporate the use of google analytics to get some qualitative data. What experiments would you do to inform adoption or make improvements? 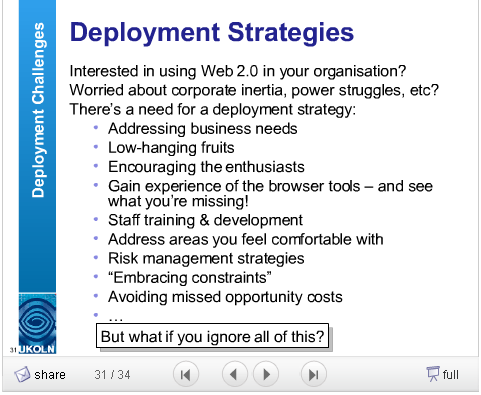 This is slide 31 of an interesting presentation about Web2.0 from the perspective of an IT department director, Brian Kelly at the University of Bath in the UK. 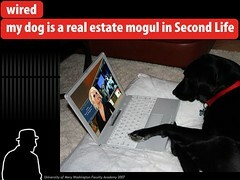 I found it in one of my more recently required addictions - SlideShare. In the middle, the slides cover the tools. But as bookends at the start and finish, there is some great thinking about Web2.0 adoption, risks and benefits, and how an IT director or department might think about a deployment strategy. It also describes how Web2.0 is changing the nature of IT support. It's all done with a great sense of humor too! Web 2.0: It’s new; its cool! I followed a number of links to Brian's other presentations and a gold mine of resources.